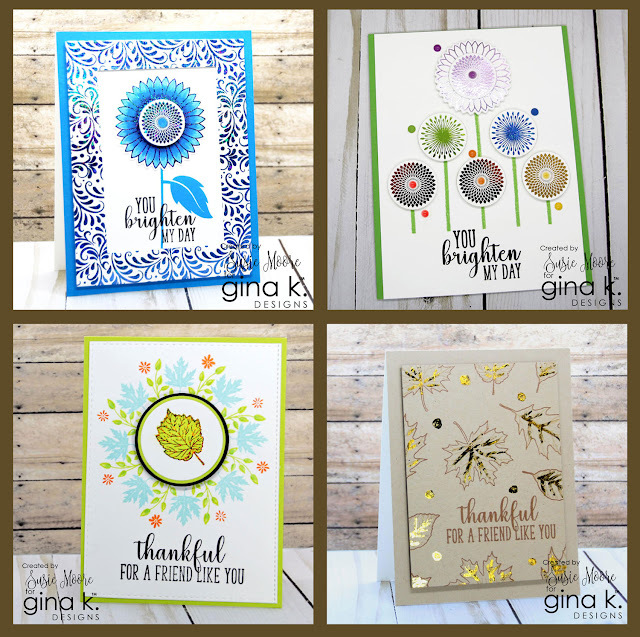 It's time for the Gina K. Designs & ThermOWeb Autumn Stamp-n-Foil Release and I can hardly wait to show you all the sparkle and shine close up! 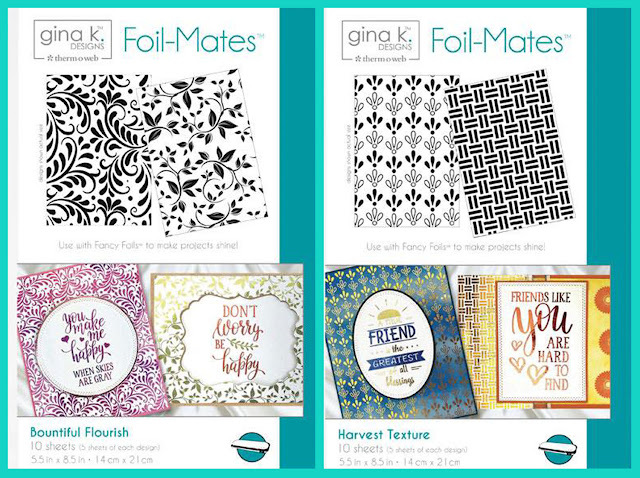 First though, take a look at all the gorgeous new products available now at Gina K. Designs. I hope you are sitting down because these eight new items are just fantastic and so much fun to use. Below are close ups of all the cards I made for today's hop. I used every new product except the Harvest Texture Foil Mates. I have posted all of the cards in the gallery at StampTV with a list of all of the supplies I used. For today's hop there are two $50 Gina K. Designs gift certificates up for grabs. You could be a winner by visiting and commenting on each designer's post (links below). Gina will announce the winners Thursday morning on her blog which is listed below. Sooo awesome Susie! I really love the one on the kraft!! Gorgeous work ~ I love the blue one! All so beautiful! Love the blue sunflower. So original! Such gorgeous cards! I love the last one - so elegant! Oh my goodness that blue sunflower is striking. I love all your cards. My favorite is the gold leaf one. 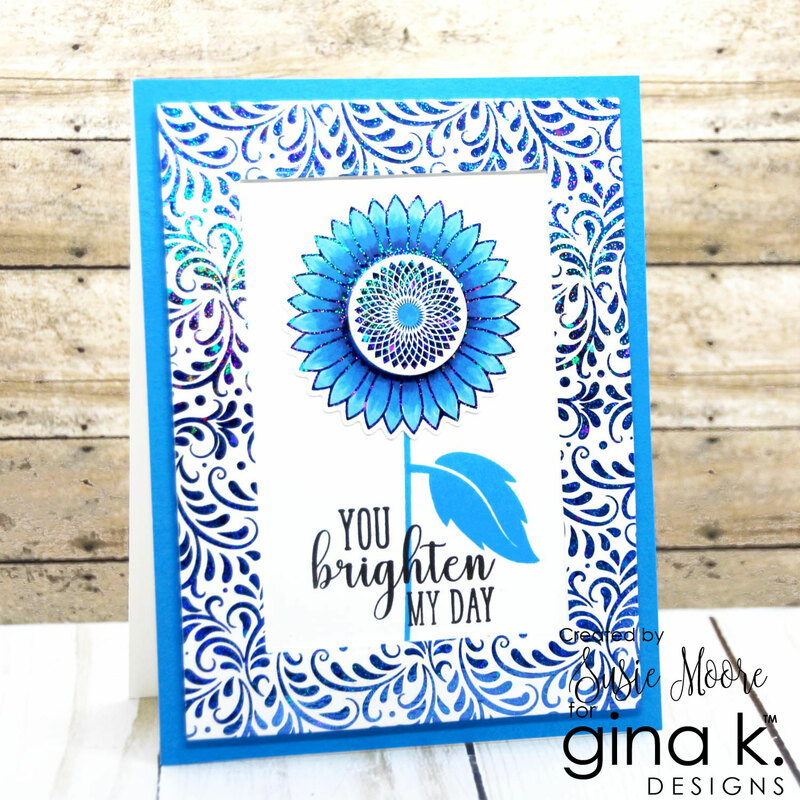 Love that blue sunflower! So gorgeous! 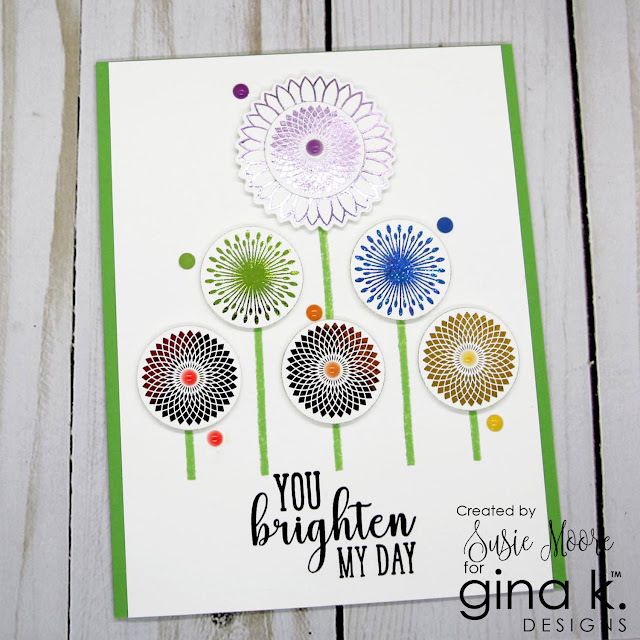 Beautiful card designs using the Gina K products!! Lovely new release and beautiful creations! Wonderful cards. Especially love the 2 with leaves. I'm loving that blue card. So unexpected in the blue, but gorgeous. I also like that it ounces for gold on the brown leaf card. The second card just makes you smile. Bright and adorable. Gorgeous cards but I especially love your "Thankful for a Friend Like You" card. It is absolutely beautiful! Very refreshing to see a pop of colors love the cards. Awesome cards! Love the blue and the gold cards! Thanks for sharing! Oh my, love your out of the box use of color! Beautiful cards!!!! That blue sunflower is stunning! Love your cards and this new release! Gorgeous cards! Thanks for sharing! Can't wait to play with mine when they come! I love that blue sunflower card. They're all gorgeous. Such bright and happy colors! Thank you for sharing! Beautiful cards, Susie! I especially love your kraft and gold creation...very pretty! They are all beautiful Susie, but my favorite is the gold foil on the leaves one! These cards are beautiful Susie! Love the blue sunflower. I love your bright and beautiful flowers! The blue card is stunning. Love your gorgeous cards and foiled backgrounds. Such pretty designs on these florals and the leaves are fab. Thanks for the inspiration. Your cards are so beautiful with those foils. The kraft and gold is beautiful and elegant. These are all fantastic but my fave is the gold leave one at the end. Wow. Lovely cards, especially LOVE that last one with the leaves!! Thanks for the inspiration!! Such great products and projects. I love all of these. Love the way you artistically modernized the graphic Sunflowers in a tree shape. And I love the way you showcased a leaf in your round about card. Awesome things one can do with this versatile autumn set. Thanks for the wonderful inspiration. Gorgeous cards! Loved the blue sunflower, so cute! Beautiful cards. The gold foiled leaves background is stunning. The blue sunflower is stunning! Love the foiled leaves on kraft too! Fabulous cards Susie, I love the blues. The leaf card is stunning. I love this release. Thank you. Wonderful cards. I really like the blue! Fabulous cards, but especially like the last one with the gold leaves. Your cards are all lovely. I love how you've turned the sunflower centers into flowers. The gold leaves are beautiful. Love these cards, especially the wreath one!! super love the blue one! Oh my.....love....and cannot decide which one I love the most....amazing. Wow! Love the blue card! All the projects are beautiful! Thank you for sharing! Wow - that blue sunflower card is my favorite of all the ones I have seen today. I really love that sunflower stamp set and your cards are amazing!! Susie the top two cards are my favorite in this post. Love the blue and the rainbow ofcolors on the second one. These are all great cards, but my favorite is the one where the sunflowers look like all-day suckers! My mom always got those when she was a kid. My aunts and uncle would get something that they would finish right away and my mom would have her sucker yes all day long. Amazing cards! Beautiful, fun and happy. Lovely designs, I especially like the graphic look of the second card. The thankful for you card really spoke to me. Great cards! I love all the different colors you used on your beautiful cards. The last one is stunning! I love the creative choice of color in the blue card! Would never have thought to do that way but it is fabulous! Bravo on your card designs! Lovely work using the new release. I really love those leaves! You look at sunflower and automatically think yellow, but the blue is fabulous! Love it so much and yes it would brighten anyone's day. Way to think out of the box! Loving those leaves! Are cards are beautiful!! wonderful cards, my favorite is the blue one you brighten my day and Kraft card. Susie...all are beautiful however your final card on kraft with the touches of foil on the leaves is incredible! Thank you for all the wonderful ideas you shared for using our products! I love your gold leaf card. Great cards!! My favorites are the first one with the foiled background and the last one with gold foiled leaves. Thank you for the ideas. Love the foiled leaves background! Whoa! This release is pure awesomeness! Foil, Autumn and sunflowers! What a winning combination!!! Gorgeous cards showcasing the new foil mates. Wow! Awesome cards-just love the blue sunflower!! Cool that you use fall/thankful release, but create cards that can be used any time. All are lovely, but the blue one is my fav. Love the brighten my day card. Beautiful colors. Your set of fall cards is really gorgeous ! I love your pretty unique colour combos. Lovely cards! Thank you for sharing!! Your cards are beautiful but my favorite is the last one on kraft cardstock...Gorgeous! Love the colors you chose! Brilliant ! Lovely use of foil on the last card. They are all beautiful. Beautiful cards! Especially like the blue sunflower!